It’s finals week!! This semester has been a whirlwind and I have my first final this afternoon, so I’m taking a quick study break to bring you this college fashion post! I’m working on setting some new blogging goals for the new year, and I’ll have a post up about all those soon (along with an updated list of my completed goals from 2017! ), but one of my main goals for my blog is to write and post more. I want to create more posts for you all, so I want to try to add in some shorter candid posts, like this one, along with my usual longer posts. I’ve been slacking in the “creating” aspect for a bit now, so I hope that allowing myself to craft some simpler posts will help me get back on the right track. Like I said, it’s been a crazy semester and it’s been more difficult than ever to balance and exceed at everything on my plate. If you read this post, you know that things have been extra-busy-busy for me. I thrive in the busyness, but being an honors student, serving on my sorority’s executive board, writing this blog, and managing my own Etsy store can be a bit much at times. I absolutely love this life I’m living, and I’m so thankful to have all the opportunities I have. But, one girl can only handle so much! I didn’t mean for this post to turn into a life-rant, but I want to include more of my personal life on this blog, (as that’s a big reason why I started it in the first place). For now, I hope you enjoy this “everyday look” that’s been my go-to this year. Yes, we’re still wearing short-sleeves here in ever-sunny Florida! These pictures were actually from Black Friday, I just didn’t have the chance to post them yet. When I’m not wearing a big t-shirt and leggings, I go for things that are super-comfy and wearable. I found this loose pink top on clearance at Express, and I wore it on repeat in the warmer weather of Thanksgiving break. 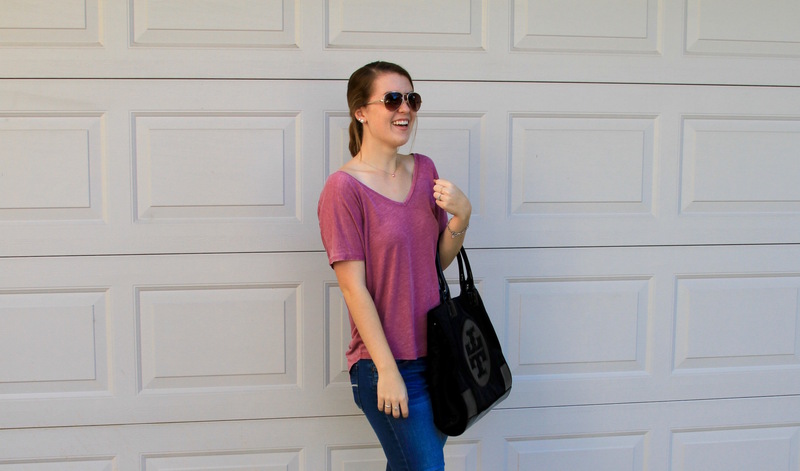 These Tory sandals are one of my all-time faves, and this big tote bag was my best Poshmark find ever! I was so excited to find it in almost-new condition for 70% off! How’s that for college-budget-style?! That’s all for now, send some prayers my way for finals this week, and good luck to you if you’re wrapping up the semester, too! Good luck girl!!! Keeping you in my thoughts. Finals week stinks! P.s That bag looks like it can hold my entire life in it. Just the size I need right about now. Thanks, girl! That’s absolutely why I love it, I’ve barely put it down since I got it! I’ve used it for classes every day & running errands. It really is the best, so worth it! Love this comfy look! Your bag is absolutely adorable too! Hope you did well on your finals! Thanks girl! I just got my final grades back today but everything ended up pretty well! Hope your finals went well! I love how cute and comfortable your outfit looks…especially love the top and shoes! Also, this is my first visiting your blog and I love it as well as your blog design. Have a great day!